It’s funny to realize that I’ve had this blog now for over 5 years. And it’s funny to think, when I come across some news story or event, “I think I wrote about that on my blog once…” Such was the case this year in realizing it was, once again, time for the Nathan’s Hot Dog Eating Contest. If you want to know the results I’ll leave them to you, but I thought it a good opportunity to “go to the archives” and point you to my blog post from a year ago: American American. A few things show the movement of the past year, but the sentiment still rings true. Also, I thought I’d add a few more topics to the mix I didn’t cover last year, including this infographic about education vs. incarceration and another blog post about obesity (and it’s obvious connection to our country’s excess), fat (and getting fatter). Enjoy yourself, and remember your connection to everyone, not just in your own country but with everyone around the world. Update: Let me add here also a nice opinion piece in the NY Times called The Downside of Liberty,connecting the expansion of individualism to the wealth disparity currently evident all over the place. It’s July 4, y’all, the day we celebrate the creation of these (wonderful) United States of American in 1776 with the adoption of the Declaration of Independence, and I’m back blogging with a vengeance! I’m not going to pretend the U.S. doesn’t have some pretty great things going for it; if you check out the kind of overt oppression happening the last few months in Libya, Syria, and Yemen, I think all of us citizens of the U S of A can all be thankful to live where we do. Economic Disparity: If you ask me, this is from where all the problems stem. We’re a country where the rich get richer and the poor get poorer, and with a system where those with money are in power or paying to get their friends into power (see below), the cycle will continue. 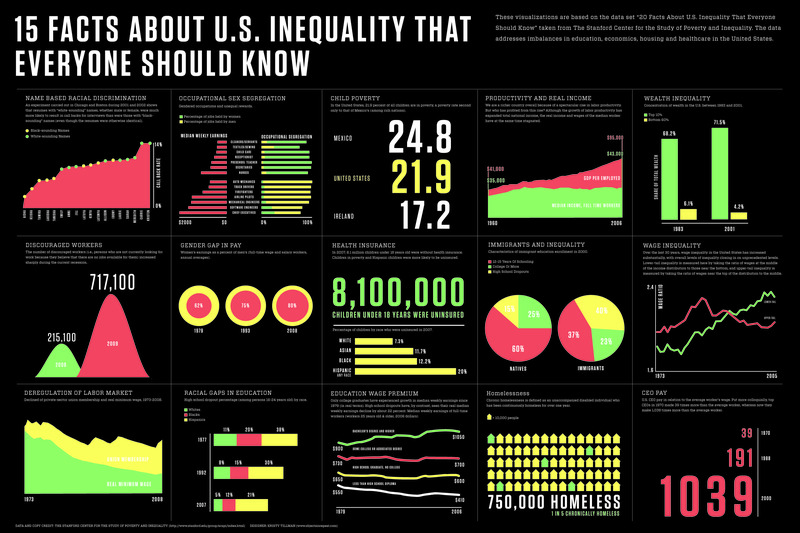 A few infographics (Inequality, Stupid; 15 Facts) and this amazing article, “Who Rules America,” tell the story pretty well, but the basic idea is that the top 1% of Americans has as much money and wealth as the bottom 90%, a group that itself is fairly stratified. Thus, the $1 you and I might spend on a meal means Oprah gets to spend $90. Does that seem right to you? “Free” Speech: In the past few years, the Supreme Court has basically determined that the right to free speech means the right to as much speech as you’re willing and able to pay for. This means that should I run for office, I can choose to forgo getting in bed with corporations and wealthy individuals and stay true to my ideals, but if someone else is well-financed, they can pretty much drown out me and my voice. Basically, free speech doesn’t mean equal amounts of speech, and in this game, if you have money, you win and get to make the rules that help you get more money, though this has been true for awhile, it’s just become even moreso as of late. Health Care: I’m guessing I don’t have to inform you that we still don’t have universal health care. Yes, there was a bill passed that requires everyone to purchase health care, I’m aware, but universal health care this is not. Instead, what this does is create an even a larger pool of participants for private insurance companies to reap more money and profits from the estimated 50+ million without insurance. And with Medicare and Medicaid on the ropes, those who would lose such benefits would now also be required to “buy” insurance, again putting money in the hands of private companies. Why is health care not something we feel is a human right, afforded to everyone, like a high school education? Education: While we’re on the topic of universal rights, can we discuss the horrific state of the education system of this country? In Chicago, the high school graduation rate in 2010 was only 56% (an improvement from 1999’s 47%, but still a travesty). Big cities across the country have similar stories. A lot of this, again, comes back to money. With all the states of which I’m aware using property taxes to fund education, this means more money is spent on education in wealthy areas than poor areas. And if you have money and don’t like your school system, you either move or simply send your kids to a private school. If we truly valued education the way we give it lip service, we’d fund it as such. Competitive Eating: If anything is representative of the excess that has become this country, it’s the event held on Coney Island each July 4: Nathan’s Hot Dog Eating Contest. This year’s winner, Joey Chestnut, ate 62 hot dogs in 10 minutes (and of course the 20 or so other contestants ate a lot, too). Yet there are still families heading to soup kitchens and food pantries because they have nothing to eat. What drives something like this? Well, this year’s event was (again) broadcast live on ESPN, with Pepto-Bismol as a top sponsor. I’m going to guess advertising money. This is by no means an exhaustive list. I don’t have time today to write about issues of housing, transportation, Social Security, unemployment, prisons and criminal (in)justice, war and foreign policy, and many others — I want to enjoy my day off, too! But as we celebrate today and in days to come, let’s not be complacent with the current ways of our country. We still live in a democracy, which means power to the people if we choose to claim it. preventative medicine: what a thought! I started reading T.R. Reid’s book “The Healing of America: A Global Quest for Better, Cheaper, and Fairer Health Care” this week, which I picked up at the library after talking about it in a past post, so I hope to write more on that later. So far, it’s a pretty easy read, not too dense or technical but contains a lot of readable information (which should be true for a good journalist’s writing), so I still recommend it. What starting that book has helped me realize is that what I care most about is health care being universal for all people. There are many countries doing it in many different ways, but they cover everyone with some kind of basic care that allows people not to have to worry about general health care costs ruining their life. You would think people could get behind that much and then it just be the “devil in the details,” but I still wonder if everyone believes health care coverage is a right and not a privilege. Perhaps that’s the debate we need to be having now that a bill has been passed — winning the hearts and minds of people regarding the issue about universal health care so we can be better able to make more changes that will (almost assuredly) need to happen. I read two articles this week that I wanted to share in relation to health care. The first article is simply Governor Mitt Romney on Health Care, regarding his take on the health care bill and how it relates to what was passed in his state of Massachusetts, a bill he backed. His big beef, at least how he wants to portray it, is that he thinks health care is a state issue and should be treated that way as opposed to a national mandate to carry coverage. However, because there is so much mobility of people within the U.S., and because you’re a citizen not of a state (only a resident there), I have to disagree and say this is rather a national issue. If the U.S. were more akin to the E.U., then maybe I could get behind that argument, but from what I can tell, all I needed was transportation to move from Ohio to Illinois to Wisconsin (and on and on, like I have), whereas trying this from Germany to Italy to Spain, etc., would take visa upon visa upon visa, and simply living in Germany wouldn’t get me free health care any more than me showing up in Boston tomorrow would get me free health care there. The U.S. is one country (for the foreseeable future), and health care needs to be looked at in that way. The second article that sparked my interest was another in the NY Times “Room for Debate” series, titled “Stupak’s Abortion Deal and His Exit.” It gives an interesting debate on how abortion policy and positions affect politics. I’ve always been the kind of person who felt like not much would change in the political spectrum because of the views of whatever politician I was electing, so I never really even take their views on the topic into consideration. However, many people do, and many people will not vote for someone who does not hold convictions regarding abortion they can support. If you believe that laws banning abortion will end abortions, you need to watch Vera Drake or 4 Months, 3 Weeks, and 2 Days (or both), movies about those who have and carry out illegal abortions in various societies and time periods (1950s Britain and 1980s Romania, in particular). Having never been a situation where I had to think about whether or not to have an abortion, I find it very hard to think about what I might do if put in a situation where abortion might be seen by some as the best option. And because I’m not really one to tell others what to do, I don’t want to say what is or isn’t the right decision in such situations. I think if it came right down to it, I don’t think I could go through with an abortion, but instead of forcing others to do that themselves by law, I think we need to discuss the issue in a way that helps people first avoid as much as possible putting oneself in a situation to make that decision, and also to help people realize there are other options beyond abortion. Perhaps that puts me in the middle ground that the article notes may be fading, but I think that instead of moving toward the edges, we all really need to be finding ways to grow closer together. According to the U.S. country profile, education and health are strong points, with equality more or less being established (ranking #1 overall for educational attainment). However, economic and political equality leave something to be desired (the U.S. ranked #61 in political empowerment, with 1 female for every 5 males in “parliament,” as they denote it). So what does all this mean for us here in the States? Well, for starters, it shows that while we may say men and women are equal, the end results don’t point that out. We may educate women equally, and they may even live longer (on average) than men, but women here do not possess the same economic resources and wealth as men and are not represented in government even close to equally. We must again recognize the systematic structures in place creating these disparities and work to truly make women and men equal, in this country and around the world. Day 2 contained multiple views and comments on the health care bill via a link to a NY Times article. Day 3 contained links to Democracy Now! clips relating to the continuation of the for-profit system and palliative care. Day 4 featured more of my comments in relation to the cost of health care mixed in with articles and other comments on the same topic. I want to close out this week thinking about the ethics and morality of the United States’ health care system, especially in lieu of what goes on in other “wealthy” countries around the world. “As Americans search for the cure to what ails our health-care system, we’ve overlooked an invaluable source of ideas and solutions: the rest of the world. All the other industrialized democracies have faced problems like ours, yet they’ve found ways to cover everybody — and still spend far less than we do. He goes on to share some very interesting facts (see below). T.R. Reid: They’re into that, yeah. TRR: Well, there are a lot of commodities where we say, “If you’ve worked hard and have the money or inherited the money, you get it.” The question is whether health care is that kind of commodity, and the economist term for this is the distributional ethic. What’s your ethic for distributing goods? Well, we have a distributional ethic for votes: everybody get’s one. TRR: Bill Gates gets one, his chauffeur gets one. Right? Uh, we have a different distributional ethic for yachts. TRR: If you have money, you can have ten of ’em; if you don’t have money, tough, and we don’t mind that. So here’s the question: do you think health care is more like voting or is it more like yachting. Well, what I found in my book is all the other countries have said, “No, this is, this is like voting. This is like education. This is like equal treatment. Everybody should have the same.” But the U.S. hasn’t made that commitment. Isn’t it time the U.S. made that commitment? Should health care be more like education, where the U.S. provides a basic service to all people, or do we want to keep our current system where only those with certain money or connections obtain basic, life-giving health care? This reform bill claims to accord everyone care while still letting people make money from it, but I think we’re going to see that you can’t do both, and then we’ll have to choose how we want to more forward. As Mr. Reid notes in his interview, universal health care — which comes in many shapes and forms around the world — would take a massive overhaul of the system, not just attempts to tweak the system that this health care bill tries to accomplish meaningful change with. Perhaps this is a good first step, but hopefully more and more people will begin to recognize the moral imperative of universal health care and call for a system that no longer discriminates and kills in the way our current system does. I encourage you to be someone who does just that. As for those notorious waiting lists, some countries are indeed plagued by them. Canada makes patients wait weeks or months for nonemergency care, as a way to keep costs down. But studies by the Commonwealth Fund and others report that many nations — Germany, Britain, Austria — outperform the United States on measures such as waiting times for appointments and for elective surgeries. In Japan, waiting times are so short that most patients don’t bother to make an appointment. U.S. health insurance companies have the highest administrative costs in the world; they spend roughly 20 cents of every dollar for nonmedical costs, such as paperwork, reviewing claims and marketing. France’s health insurance industry, in contrast, covers everybody and spends about 4 percent on administration. Canada’s universal insurance system, run by government bureaucrats, spends 6 percent on administration. In Taiwan, a leaner version of the Canadian model has administrative costs of 1.5 percent; one year, this figure ballooned to 2 percent, and the opposition parties savaged the government for wasting money. The key difference is that foreign health insurance plans exist only to pay people’s medical bills, not to make a profit. The United States is the only developed country that lets insurance companies profit from basic health coverage. So here we are Day 4 of my week-long focus on the health care reform bill. On Day 1, I shared with you my thoughts on the new health care reform bill (I’ve heard people say they liked this, but no comments on the blog — I love it when you comment on the blog!) If you haven’t read it yet, it’s the place to start. Day 2 contained multiple takes on the health care bill from prominent politicians and such, via a link to a NY Times article. Yesterday (Day 3) contained links relating to the continuation of the for-profit system and on palliative care. Today, I wanted touch on the headlines discussing the cost of health care in general, taking special note of the recent headlines related to new costs for businesses. “People like to live too much. “The percentage of Americans with a “high financial burden for healthcare” rose to 19 percent in 2006 from 14 percent in 2001, according to the Washington-based Center for Studying Health System Change. So “Who’s going to pay?” Let’s agree that we all need to take care of each other and thatwe can share the costs of our another’s health based on our economic abilities. Who’s in?